The present study investigates the tropical climate response in the years following the eruption. It is found that a simple relaxation response, driven by volcanic radiative ‘forcing’, provides a close match with the variations in TOA energy budget. The derived scaling factor to convert AOD into radiative flux, supports earlier estimations  based on observations from the 1982 El Chichon eruption. These observationally derived values of the strength of the radiative disturbance caused by major stratospheric eruptions are considerably greater than those currently used as input parameters for general circulation climate models (GCMs). Two alternative time-constants for the relaxation response are derived, depending on the whether a cyclic, pre-eruption variability is taken into account or not. This is found to have little effect on the derived magnitude of the aerosol forcing. Changes in net TOA radiative flux, measured by satellite, were compared to volcanic forcing estimated from measurements of atmospheric optical depth. Regional optical depth data, with monthly resolution, are available in latitude bands for four height ranges between 15 and 35 km [DS1] and these values were averaged from 20S to 20N to provide a monthly mean time series for the tropics. Since optical depth is a logarithmic scale, the values for the four height bands were added at each geographic location. Measurements for the period concerned come from SAGE II satellite data. Lacis et al  suggest that aerosol radiative forcing can be approximated by a linear scaling factor of AOD over the range of values concerned. This is the approach usually adopted in IPCC reviewed assessments and is used here. As a result the vertical summations are averaged across the tropical latitude range for comparison with radiation data. One notable effect of the eruption of Mt Pinatubo on tropical energy balance is a variation in magnitude of the annual cycle, as see by subtracting the pre-eruption, mean annual variation. The sun passes over the tropics twice per year and the mean annual cycle in the tropics shows two peaks: one in March the other in Aug/Sept, with a minimum in June and a lesser dip centred around the new year. The residual annual variability is also basically a six monthly cycle. Following the eruption, the annual variation increased and only returned to similar levels after the 1998 El Nino. It follows that using a single period as the basis for the anomaly leaves significant annual residuals. To minimise the residual, three different periods of multiples of 12 months were used to remove the annual variations: pre-1991; 1992-1995; post 1995. The three resultant anomaly series were combined, ensuring the difference in the means of each period were respected. The mean of the earlier, pre-eruption annual cycles was taken as the zero reference for the whole series. There is a clearly repetitive variation during the pre-eruption period that produces a significant downward trend starting 18 months before the Mt. Pinatubo event. Since it may be important not to confound this with the variation due to the volcanic aerosols, it was characterised by fitting a simple cosine function. Though the degree to which this can be reasonably assumed to continue is speculative, it seems some account needs to be taken of this pre-existing variability. The effect this has on the result of the analysis is assessed. Since the TOA flux represents the net sum of all “forcings” and the climate response, the difference between the volcanic forcing and the anomaly in the energy budget can be interpreted as the climate response to the radiative perturbation caused by the volcanic aerosols. This involves some approximations. Firstly, since the data is restricted to the tropical regions, the vertical energy budget does not fully account for energy entering and leaving the region. There is a persistent flow of energy out of the tropics both via ocean currents and atmospheric circulation. Variations in ocean currents and atmospheric circulation may be part of any climate feedback reaction. This value provides a reasonably close match to the initial change in ERBE TOA flux. However, later studies,  , attempting to reconcile climate model output with the surface temperature record have reduced the presumed magnitude of the effect stratospheric aerosols. With the latter adjustments, the initial effect on net TOA flux is notably greater than the calculated forcing, which is problematic; especially since Lacis et al reported that the initial cooling may be masked by the warming effect of larger particles ( > 1µm ). Indeed, in order for the calculated aerosol forcing to be as large as the initial changes in TOA flux, without invoking negative feedbacks, it is necessary to use a scaling of around 40 W/m2. A comparison of these values is shown in figure 4. It should be noted that there is a strong commonality of authors in these papers, so rather than being the work of conflicting groups, the more recent weightings reflect the result of a change of approach: from direct physical modelling in 1992 to the later attempts to reconcile general circulation model (GCM) output by altering the inputs. The fact that the climate is dominated by negative feedbacks is not controversial since this is a pre-requisite for overall system stability. The main stabilising feedback is the Plank response ( about 3.3 W/m2/K at typical ambient temperatures ). Other feedbacks will increase or decrease the net feedback around this base-line value. Where IPCC reports refer to net feedbacks being positive or negative, it is relative to this value. The true net feedback will always be negative. It is clear that the climate system takes some time to respond to initial atmospheric changes. It has been pointed out that to correctly compare changes in radiative input to surface temperatures some kind of lag-correlation analysis is required : Spencer & Bradwell 2011, Lindzen & Choi 2011. Both show the strongest direct correlation peaks at a lag of about three months. After a few months negative feedbacks begin to have a notable impact and the TOA flux anomaly declines more rapidly than the reduction in AOD. It is quickly apparent that a simple, fixed temporal lag is not the most appropriate way to compare the aerosol forcing to its effects on the climate system. The simplest physical response of a system to a disturbance would be a linear relaxation model, or “regression to the equilibrium”, where for a deviation of a variable T from its equilibrium value, there is a restoring action that is proportional to the magnitude of that deviation. The more it is out of equilibrium the quicker its rate of return. This kind of model is common in climatology and is central of the concept of climate sensitivity to changes in various climate “forcings”. dT/dt= -k*T ; where k is a constant of proportionality. The solution of this equation for an infinitesimally short impulse disturbance is a decaying exponential. This is called the impulse response of the system. The response to any change in the input can found by convolution with this impulse response. This can be calculated quite simply since it is effectively a weighted running average calculation. The effect of this kind of system response is a time lag as well as a degree of low-pass filtering which produces a change in the profile of the time series, compared to that of the input forcing. The variation of the tropical climate response is compared with a linear relaxation response to the volcanic forcing. The magnitude and time-constant provide two free parameters and are found to provide a good match. This is not surprising since any change in surface temperature will produce a Plank feedback to oppose it. The radiative Plank feedback is the major negative feedback that ensures the general stability of the Earth’s climate. While the Plank feedback is proportional to the fourth power of the absolute temperature, it can be approximated as linear for small changes around typical ambient temperatures of about 300 kelvin. It is this delayed response curve that needs to be compared to changes in surface temperature to determine the overall climate sensitivity. Regressing the temperature change against the change in radiation is not physically meaningful unless the system can be assumed to equilibrate much faster than the period of the transient being studied, ie on a time scale of a month or less. This is clearly not the case, yet many studies have been published which do precisely this, or worse multivariate regression, which compounds the problem. The need for this can be seen in figure 6. The in-phase climate feedback response ( shown negated ) that informs about climate sensitivity is confounded with the orthogonal response (the integral of the rate of change of temperature which is what is actually induced by a radiative forcing). Simply shifting the volcanic forcing forward by about a year would line up the “bumps” but not match the profile of the two variables. Therefore simple regression or even a lagged regression would not correctly associate the two variables: the differences in the temporal evolution of the two leads to a lower correlation, a reduced regression result leading to incorrect values of climate sensitivity. This lagged response to radiative change corresponds to the negative quadrant in Spencer and Braswell’s  figure 3b excerpted below, where temperature lags radiative change. It shows the peak temperature response lagging around 12 months behind the radiative change. The timing of this peak is in close agreement with figure 6 above, despite SB11 being derived from CERES (Clouds and the Earth’s Radiant Energy System) satellite data from the post-2000 period with negligible volcanism. This analysis attempts to address that problem by analysing the fully developed response. The equation of the relationship of the climate response : ( TOA net flux anomaly – volcanic forcing ) being proportional to an exponentially lagged AOD, is re-arranged to obtain an empirical estimation of the scaling factor by linear regression. VF is the scaling factor to convert ( positive ) AOD into a radiation flux anomaly in W/m2. The exp_AOD term is the exponential convolution of the AOD data, a function of the time-constant tau, whose value is also to be estimated from the data. This exp_AOD quantity is multiplied by a constant of proportionality, k. Since TOA net flux is conventionally given as positive downwards, it is negated in equation 2 to give a positive VF comparable to the values given by Lacis, Hansen, etc. The regression was performed for a range of time-constants from 1 to 24 months. The period for the regression was from just before the eruption, up to 1994.7, when AOD had subsided and the magnitude of the annual cycle was found to change, indicating the end of the initial climatic response ( determined from the adaptive anomaly shown in figure 2 ). Since the relaxation response effectively filters out ( integrates ) much of high frequency variability giving a less noisy series, this was taken as the independent variable for regression. This choice acts to minimise regression dilution due to the presence of measurement error and non-linear variability in the independent variable. This is a fundamental problem when using regression techniques in this situation. Failure to addressed it leads to spuriously low regression values. For noisey data this can lead to serious errors. This is an important and pervasive problem that is often overlooked in published work in climatology. Notably in attempts to derive an estimation of climate sensitivity from temperature and radiation measurements and from model output. tau = 6 months gave 54 and this was taken as the lower limit for the range time constant to be considered. This presented a problem since, even with adaptive anomaly approach, there remains a significant, roughly cyclic, six month sub-annual variability that approaches in magnitude the climate response of interest. The relative magnitude of the two also varies depending on the time-constant used, making a simple correlation test unhelpful in determining the best correlation with respect to the inter-annual variability. For this reason it could not be included as a regression variable. Also the initial perturbation and the response, rise very quickly from zero to maximum in about two months. This means that low-pass filtering to remove the 6 month signal will also attenuate the initial part of the effect under investigation. For this reason a light 3-sigma gaussian filter ( sigma = 2 months ) was used. This has 50% attenuation at 2.3 months. comparable to a 4 month running mean filter ( without the destructive distortions of the latter). This allowed a direct comparison of the rise, duration of the peak and rate of fall-off in the tail that is determined by the value of the time-constant parameter, and thus the value producing the best match to the climate response. This delay in the response, due to thermal inertia in the system, also produces an extended period during which the direct volcanic effects are falling and the climate reaction is thus greater than the forcing. This results in a recovery period, during which there is an excess of incoming radiation compared to the pre-eruption period which, to an as yet undetermined degree, recovers the energy deficit accumulated during the first year when the volcanic forcing was stronger than the developing feedback. Thus if the lagged nature of the climate response is ignored and direct linear regression between climate variables and optical depth are conducted, the later extended period of warming may spuriously attributed to some other factor. This represents a fundamental flaw in multivariate regression studies such as Foster & Rahmstorf 2013  that could lead to seriously erroneous conclusions about the relative contributions of the various regression variables. For the case where the pre-eruption variation is assumed to continue to underlie the ensuing reaction to the volcanic forcing, the ratio of the relaxation response to the aerosol forcing is found to be 0.86 +/- 0.07%, with a time constant of 8 months. The scaling factor to convert AOD into a flux anomaly was found to be 33 W/m2 +/-11%. With these parameters, the centre line of the remaining 6 month variability ( shown by the gaussian filter ) fits very tightly to the relaxation model. If the downward trend in the pre-eruption data is ignored (ie its cause is assumed to stop at the instant of the eruption ) the result is very similar ( 0.85 +/-0.09 and 32.4 W/m2 +/- 9% ) but leads to a significantly longer time-constant of 16 months. In this case, the fitted response does not fit nearly as well, as can be seen by comparing figures 6 and 8. The response is over-damped: slow to drop and too slow to rise back up, indicating this time-constant is too long. It is also noted that the truncated peak, resulting from substitution of the mean of the annual cycle to fill the break in the ERBE satellite data, lies very close to the zero residual line. In either case, there is a strong support here for values close to the original Lacis et al 1992 calculations of volcanic forcing that were derived from physics-based analysis of observational data, as opposed to later attempts to reconcile the output of general circulation models by arbitrarily adjusting this physical parameter. Several climate studies ,, have been published which attempt to assess climate sensitivity by lagged linear regression of radiative forcing against temperature, both for observations and for assessing how climate models respond to various forcings. This is not totally satisfactory, since, while recognising the need to account for the delay, it does not account for the fact that the profile of the responsive is a different shape to that of the input. This will reduce the correlation of the two variables and thus increase the error and uncertainty of the regression result and by implication that of the derived climate sensitivity. SB11 makes just this point, showing that observed lag-response is similar to that of a 70/30 mix of radiative and non-radiative interactions and that the peak correlation at 3 months lag will considerably under-estimate the true value. This analysis models the observed results very closely with a simple relaxation response. While the simple relaxation model seems to adequately explain the initial four years following the Mt Pinatubo event, this does not explain it settling to a higher level. A clue to the this continued excess over the pre-eruption conditions can be found in the temperature of the lower stratosphere, shown in figure 3. Here too, the initial disturbance seems to have stabilised by early 1995 but there is a definitive step change from pre-eruption conditions. Noting the complementary nature of the effects of impurities in the stratosphere on TLS and the lower climate system, this drop in TLS may be expected to be accompanied by an increase in the amount of incoming radiation penetrating into the troposphere. This is in agreement with the cumulative integral shown in figure 10. Since the model fits the data very closely, the residual 15% will have the same time dependency profile as the 85%, so these tropical/ex-tropical variations can also be seen as part of the climate response to the volcanic disturbance. ie. the excess in horizontal net flux, occurring beyond 12 months after the event, is also supporting restoration of the energy deficit in extra-tropical regions by exporting heat energy. 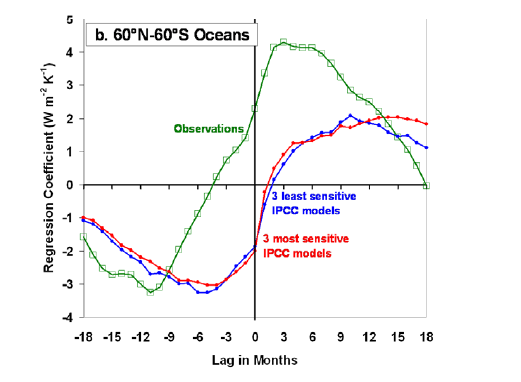 Since the major ocean gyres bring cooler temperate waters into the eastern parts of tropics in both hemispheres and export warmer waters at their western extents, this is probably a major vector of this variation in heat transport as are changes in atmospheric processes like Hadley convection. Both the TLS cooling and the energy budget analysis presented here, show a lasting warming effect on surface temperatures triggered by the Mt Pinatubo event. Unless these effects are recognised, their mechanisms understood and correctly modelled, there is a strong likelihood of this warming being spuriously attributed to some other cause such as AGW. The values for volcanic aerosol forcing derived here being in agreement with the physics-based assessments of Lacis et al. imply much stronger negative feedbacks must be in operation in the tropics than those resulting from the currently used model “parametrisations” and the much weaker AOD scaling factor. These two results, taken together indicate that secondary effects of volcanism may have actually contributed to the late 20th century warming, rather than counteracting it. This would go a long way to explaining the discrepancy between climate models and the relative stability of observational temperatures measurements since the turn of the century. Analysis of satellite radiation measurements allows an assessment of the system response to changes in radiative forcing. This provides an estimation of the aerosol forcing that is in agreement with the range of physics-based calculations presented by Lacis et al in 1992 and is thus brings into question the much lower values currently used in GMC simulations. Since this scaling factor was lowered specifically to match the output of high sensitivity models to the pre-2000 climate record (Hansen 2002), the higher values of aerosol forcing found here imply the presence of strongly negative feedbacks in tropical climate ( in excess of the base-line Plank feedback ) and hence imply a lower range of sensitivity than those used in the models. The considerable lag and implied post-eruption recovery period underlines the inadequacy of direct regression and multivariate regression in assessing the importance of various climate ‘forcings’ and their respective climate sensitivities. Use of such methods will suffer from omitted variable bias and can lead to seriously erroneous attributions. The evidence presented here of a strong, negative feedback in tropical climate countering the radiative disruption caused by major stratospheric volcanic eruptions has profound implications for the impacts of all phenomena that change the earth’s radiation balance, including the effects of anthropogenic greenhouse gases. Convolution is a mathematical process that is used, amongst other things, to implement digital filters. A relaxation response can be regarded as an asymmetric filter with a non-linear phase response. It produces a delay relative to the input and alters it’s shape. Orthogonal. Variables can be said to be orthogonal in mathematics if they are 90 degrees out of phase with each other, such as is the case for a series and its differential, or more formally, if their inner product is zero. Regression dilution refers to the reduction in the slope produced by least squares regression when there is significant error or noise in the x-variable. Under negligible x-errors OLS regression can be shown to produce the best unbiased estimation of the slope. However, this essential condition is often over-looked or ignored, leading to erroneously low estimations of the relationship between two quantities.